My UI customizations are mainly focused on PvP these days. I still do some PvE content now and again, which means it’s definitely still raid viable, it’s just ‘more geared’ towards PvP. It’s still a very minimalist interface when out of combat, yet it’s quite information-rich without being all chock-a-block while in combat. I find the layout and configuration quite pleasing and accommodating for my needs. Although there are a few great UI suites out there that look intriguing, i.e., LUI, RealUI, etc… none of them do ‘exactly’ what I want them to, and in the manner that I like, which is why I continue to tinker with my UI rather than just go with an all-in-one solution. I also like being able to change various addons within my interface — integrating them how I want. The custom UI suites are great if you like how they work out-of-the-box, but if you’re at all interested in working with something custom…you should give my UI a try. There’s a good chance that you may want to alter a few things about it, but it will provide inspiration and a very good starting point for what it is you want to accomplish. Why’s the Gar UI not on WoWInterface anymore..?! A few days ago I discovered that WoWInterface removed my UI download from their site. Initially I thought that it was due to 7+ months without an update, but I quickly noticed other comps and suites that hadn’t been updated since ’09. I contacted WoWI and they were without an explanation, but they did indicate to me that they’d at least restore my download count which had been in the neighborhood of 9K downloads. It’s likely that I’ll take this opportunity to place the download into a more Hunter/DPS specific category, rather than the general ‘minimalist’ category. I’ll update the links here on the site once it’s back up. So what’s changed in the UI..? Not a lot. I’m still utilizing many of the same addons that have served me well over the past few years. I’ve removed a couple and added a few new ones, but it more or less feels very familiar. The only notable behind-the-scenes change has been the switch from SatrinaBuffFrame to Raven, along with configuring Raven to handle the limited duties I’d placed upon NeedToKnow. SatrinaBuffFrame is dead, so I removed it altogether, but NeedToKnow I’m keeping around just because it’s so awesome. I don’t have a use for it just this second, but I may very well find a use for it again real soon. All of the unit frames are slightly larger, especially the player and target frames. I really appreciate a minimalist interface, but I still want all of the information I need to be easy to see. Larger health and focus bars are more user-friendly for my 40 year old peepers. Tidy Plates / Threat Plates will be included. I am pretty smitten with this addon, so it will definitely be included in the new compilation. I’ve toned down my Power Auras usage a bit, however, the configs are still included – just set to inactive. Use them if you want, in other words. Also note that I’ve made them to live comfortably alongside the default in-game auras. I installed the Clean Icon pack to provide a consistent look across the various addons that show buff and spell icons (e.g., Raven, Power Auras, etc…). I ditched Apathy and went to Renaitre for my button skinning. I wanted a look that was more on par with the Clean Icon pack, plus the icons provide a slightly larger view of the spell and cooldown – again…easier on the eyeballs. I removed BigWigs. I haven’t raided in ages, so I ended up chucking my boss mod addon. It can be easily added for those of you that are interested in using this UI for raiding. I removed the AZCastBar BG timer addon. I liked having those timers, but that addon was terribly broken. I may have a look at Capping or something similar, but it’s doubtful I’ll have anything to fill this role for the update. If any of you know of a good BG timer mod, please let me know. There are other various little tweaks, but nothing worth mentioning. I’ll have updated screenshots and more info on the UI update once it gets posted this week. Lastly, for those of you reading this who are maybe new to WoW and wondering what the hell I’m talking about with all of this custom UI business… I plan to have some ‘spotlight’ posts on the various addons I use, hoping to shed light on why I use them, how I’ve configured them and how they can improve your play. Maybe wait for those posts, then you can decide if you want to start messing with addons. Also,when you will post it,can you addd the old 3.3.5 version of ti also? 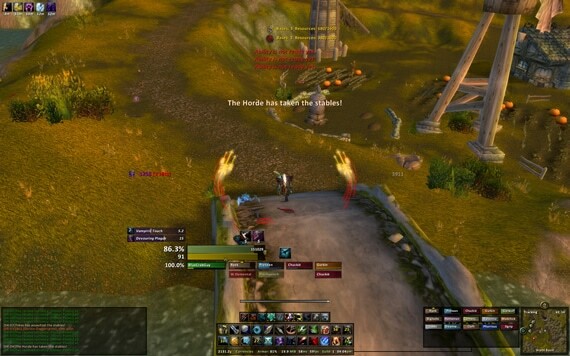 Would do us the guys that play on private servers like Molten Wow or so a huge favor:D.
Where can I download this UI in the meantime? i would really like to try this UI out…thanks! Glad to see you will be back on WOWInterface. Looking forward to trying this out when you post it. I definitly need a better way of doing things and this looks like a great placve to start. Thanks!! It’s coming along really nicely. I made a couple of last-minute changes and refinements, and I’m really quite pleased with what I’ve done with it this go ’round. Apart from those things…it seems to be working great with few if any errors. I’ve been waiting for this for awhile, I love the look you’ve created, and I was too lazy to mess with your other one…lol. Can’t wait!!! If you want to modify it slightly across your alts, you need to create a new profile via Reflux – command is: /reflux create NewProfile (NewProfile being the name of your alt’s profile). Next, you copy the GarUI settings into it and then start modifying it. More detailed instructions on Reflux are here. Thanks, Gar, awesome, as always. Can hardly stand to wait for the UI 4.3 update. It’s a great look and I’ve enjoyed using it.